For each of the last six summers, our family has traveled from New Jersey to the scenic Lakes Region area of New Hampshire. Here, our daughter has attended Camp Bernadette and our sons, Camp Fatima. These camps, opening in 1953 and 1949, respectively, have enhanced the spiritual formation of our children with a simplistic joy that radiates into our home. Driving into the camp envelops in me a nostalgic feeling of yesteryear. I’m brought back to my youth, where I see kids playing outside from sun up until sundown. The campers play on fields and ropes courses, they shoot baskets and archery, ride horses, climb rock walls, play tennis, swim boat and much more. They play with no ear buds, no cell phones and no remotes in their hands. The kids talk with one another face-to-face with no blue screen in front of them. Together, away from technology and other secular evils that creep into our daily lives, campers and counselors live in community and fellowship in God’s beautiful creation. They have an opportunity to participate in Rosary Club, Adoration and Reconciliation and they join in community sharing prayers, meals, and Mass. In 2017, after four years of watching our children thrive as children of God in a setting reminiscent to my childhood in the 70’s and 80’s, where people understood our beautiful faith and were not afraid to express it, I found myself yearning to be a part of it. I reached out to Executive Director, Michael Drumm, expressing an interest in getting more involved intimately to help fulfil camps’ mission of providing a fun and engaging outdoor camping experience where campers and staff learn new skills and grow in faith, confidence and friendship in a joyful Catholic community offering a sense of belonging for all. I was given the opportunity to volunteer in the maintenance department for two weeks. Like anything that brings deep joy and meaning to our lives, describing the emotions I feel while volunteering at Camp Fatima each summer is difficult. Camp is a place where I see the charisms of faith, hope and charity exuded by staff and campers alike. During Mass, prayer, and teaching, I witness a joyful participation and am filled with exultation and hope for our children and this generation. The Camps fall under the Diocese of Manchester Catholic Schools’ Office and are open to children of all faiths. Approximately 70% of the over 1,600 campers who attended camp in 2018 attend public schools. Camp may be the only time during the year they are purposefully anchored in a Catholic surrounding receiving doctrinal teaching and encountering our Living God in their everyday. Here, campers play and learn alongside practicing Catholics (campers and counselors), seminarians, their chaplain, and Sr. Bernadette. Last summer, I spoke with one mom who said her daughter doesn’t feel comfortable in her school environment where she is made fun of for being a “church kid.” She said, her daughter is not comfortable sleeping outside of her home, but that she LOVES camp and believes it should be a boarding school. Another mom said, it was a place where her son started doing the rosary and now walks regularly with his Bible. Counselors and staff will tell you that it is not uncommon to see campers wearing their Fatma and Bernadette crosses (given to them on the last night of camp) months after the camping season has ended. The seeds that are planted at camp have brought forth a harvest as well. 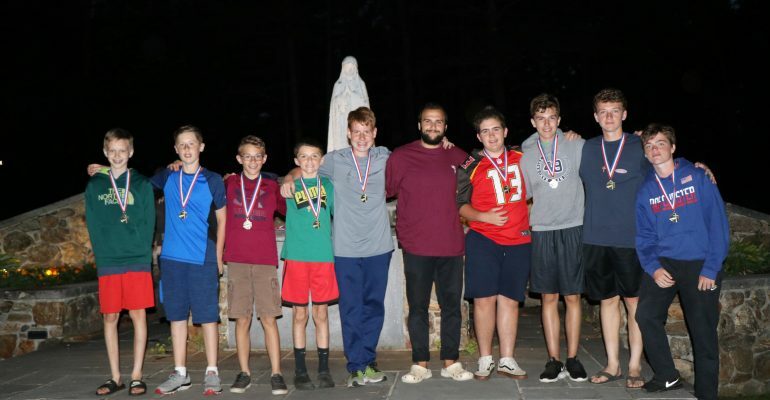 Many campers and staff have deepened their faith, been baptized, gone through OCIA, been Confirmed, and fully initiated into our Catholic faith. Some have entered seminary and become ordained priests shepherding the many who have gone on to live out their vocations as married couples raising the future generation of our Church. Our children have shared in the joy of an authentic Catholic community, they have made friends who embrace our shared faith, they are stronger evangelist in their everyday world. Three summers ago, when we shared that I would be volunteering at camp, our children were less than excited that I would be entering their own oasis of joy. Today, we plan with an eagerness for this shared experience where they will have fun and play and I will be on the sidelines hammering, nailing and painting and knowing that the Holy Spirit is alive and well at Camp. The Deane Family are strong supporters of the mission of our camps. Brian wrote this article for Legatus Magazine of which he is a member.